On July 31st the Associated Press reported an airstrike (allegedly not the first) on a hospital in the Dara’a province of southern Syria. “In southern Syria, an airstrike on a hospital in an opposition-controlled town put the facility out of service Sunday. The hospital in Jasem was targeted in one of several airstrikes to hit the town in Deraa province, located some 35 miles (57 kilometers) south of Damascus, according to the Local Coordination Committees activist network. The group said six people were killed in the strikes, blaming them on the government. The Syrian Observatory for Human Rights monitoring group said the hospital strike killed a pharmacist and put the facility out of service. In a statement later Sunday, the president of the International Rescue Committee, David Miliband, said the group was “dismayed” and “angry” at the attack on the hospital, which it was supporting. It said six people had been killed in the strike, and many more wounded. It said that across Syria “aid workers and civilians are being targeted in a merciless way on a daily basis,” and called for all those involved to be held to account. While the BBC News website has not yet reported that attack, it did publish cautiously worded written and filmed reports on an attack on another hospital in the Idlib province the previous day. The BBC has also covered previous attacks on medical facilities in Syria, including in Aleppo in June and in April. In an article from February 2016 titled “Syria crisis: Air strikes on hospitals ‘war crimes’“, the BBC News website took the trouble to provide audiences with a short guide to the legal background to the topic. 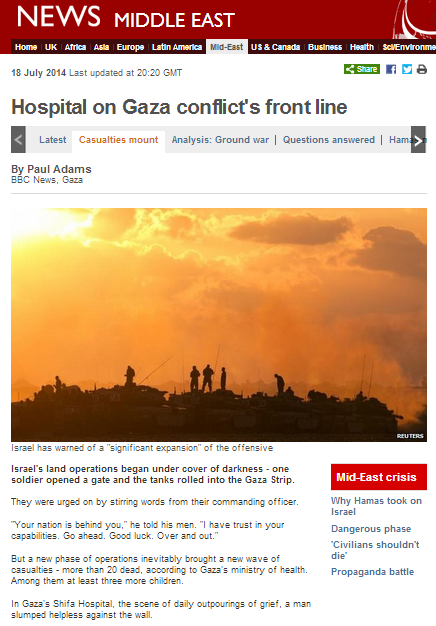 “Hospital on Gaza conflict’s front line” by Paul Adams, BBC News website, July 18th 2014 – discussed here. 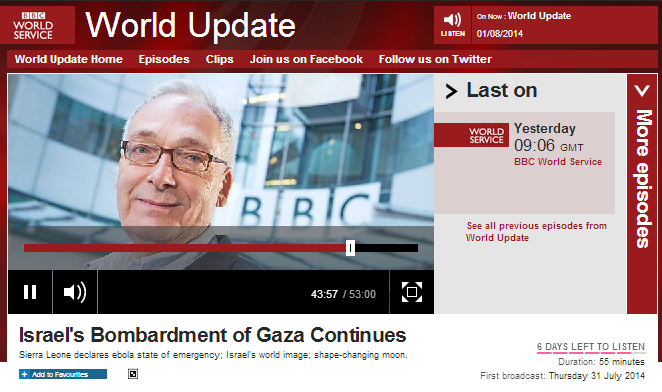 “World Update” interview with ISM activist, BBC World Service radio, July 31st 2014 – discussed here. 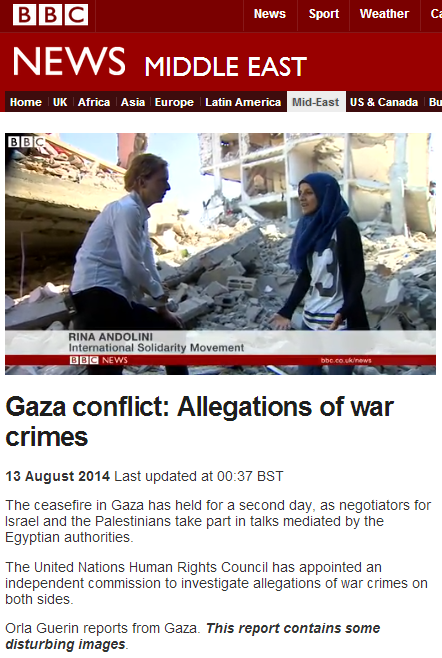 “Gaza conflict: Contrasting views on targeting” BBC News website, August 4th 2014 – discussed here. “Gaza crisis: Israel releases ‘aborted airstrike’ video” by Orla Guerin, BBC News website, July 31st 2014 – discussed here. 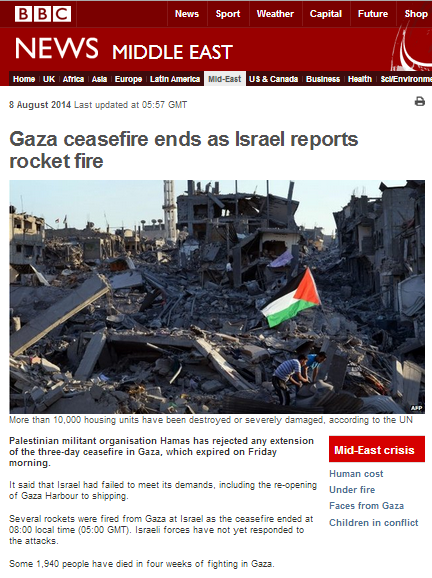 “Gaza ceasefire ends as Israel reports rocket fire” and “Israel air strikes resume in Gaza amid rockets” BBC News website, August 8th 2014 – discussed here. It has continued to promote that falsehood since the conflict ended – for example here – and also to broadcast additional denial of Hamas’ use of hospitals for military purposes. So as we see in Syria, where there is cause to believe that medical facilities really are being attacked indiscriminately, the BBC uses very cautious wording and informs its audiences of the legal background to the issue. 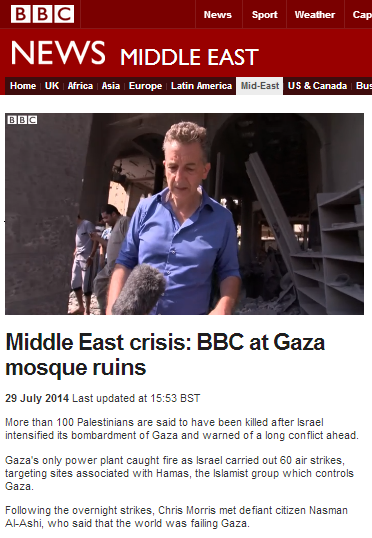 In contrast, in its reporting from the Gaza Strip in 2014, the BBC failed to provide any such background information, repeatedly promoted the theme of Israeli wrongdoing and actively misled its audiences with regard to the reason for Israeli actions against institutions such as Wafa hospital: Hamas’ use of that medical facility for military purposes. The Wafa hospital in the Shuja’iya neighbourhood of Gaza City was featured in several BBC reports produced during the conflict between Israel and Gaza Strip-based terrorist organisations this last summer. Those reports include the ones below, all of which have the common denominator of denial of Hamas’ use of that institution for military purposes and hence imply that Israeli actions against that hospital were unnecessary, unjustified and even unlawful. In reports received by the MAG Corps, and in correspondence from various NGOs, it was alleged that the Al-Wafa Hospital was unlawfully attacked by IDF forces on a number of occasions between 11-23 July 2014. As a result, and in accordance with the MAG’s investigation policy, it was decided to refer the incident for examination by the FFAM [Fact Finding Assessment Mission – Ed.]. According to the factual findings and materials collated by the FFAM and presented to the MAG, Palestinian terrorist organizations used the hospital compound for a range of varied and multiple military purposes throughout the period noted above, as well as beforehand. Such, it was found that Hamas used structures in the hospital for positioning surveillance devices so as to track IDF operational activity, that the hospital structures were used on multiple occasions as firing positions towards IDF forces, and that rockets were launched from the immediate vicinity of these structures. Further, according to materials presented to the MAG, reliable information indicated that the sole use that was made of the hospital, from a certain date onwards, was for the military purposes of Hamas, by Hamas’ military operatives. At this point, the hospital had already been evacuated of all civilians – patients and staff. According to the factual findings, on a number of occasions during this period IDF forces were forced to return immediate fire, in a discerning and precise manner, towards sources of attacking fire that posed a serious and immediate threat to those forces. The MAG is not aware of any civilian harm resulting from these incidents. 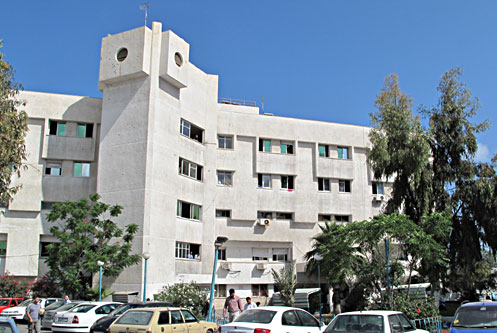 At the same time, in light of the ongoing and widespread military use made of the hospital by Hamas, a number of warnings were provided by the IDF to official entities in the Gaza Strip and to the Palestinian Authority, as well as to international organizations, requiring that the military use of the hospital be ceased. On 23 July 2014, after these warnings went unheeded and after fire was again directed at IDF forces from the hospital, it was decided to attack the hospital. The attack was only carried out after the IDF had ensured a number of times, that all civilians had evacuated the hospital and that the hospital was being used at that time solely for military purposes. After reviewing the factual findings and the material collated by the FFAM with regard to each and every incident of attack, the MAG found that, with exception to one instance which will be discussed below, the attacks were conducted in accordance with Israeli domestic law and international law requirements. The attacks were directed against military objectives, while adhering to the requirements of the principle of proportionality. Likewise, the MAG found that the attack was executed only after various precautions were undertaken, with significant efforts to minimize civilian harm. With regard to the incidents where IDF forces were faced with a serious and immediate threat to their lives, the forces returned fire immediately towards the source of the attacking fire, in a precise and discerning manner, and without harming civilians. The structures in the hospital compound were attacked and destroyed only after advance warning had been provided as required under international law, and no civilians were present at the time. The decision to attack was made in a careful and reasoned manner by the authorized authorities, after Hamas disregarded advance warnings and continued in its military use of the hospital compound, thereby resulting in the loss of the special protection from attack provided to the hospital under international law. In light of the above, the MAG did not find that the actions of the IDF forces raised grounds for a reasonable suspicion of criminal misconduct. As a result, the MAG ordered the case to be closed, without opening a criminal investigation or ordering further action against those involved in the incident. Clearly the impressions given to audiences in the above BBC produced reports are inaccurate and misleading. Those still available to the public on the BBC News website therefore need to be signposted accordingly – not least because they are potentially the source of editorial complaints. Additionally, a review of the practice of amplification of unverified claims by often inadequately presented politically motivated interviewees would obviously contribute to the avoidance of the presentation of similar inaccurate information to BBC audiences in the future. 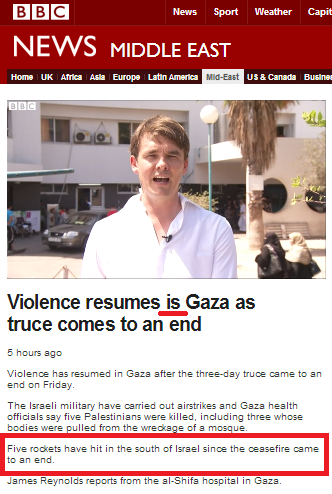 On August 9th James Reynolds produced a filmed report for BBC television news which was also promoted on the BBC News website’s Middle East page under the title “Violence resumes is [sic] Gaza as truce comes to an end“. Notably, the fact that the truce was broken by Gaza-based terror organisations and that missiles were fired from the Gaza Strip at Israeli civilians for several hours before Israel responded is not reflected in that title. In fact, on August 8th – the day before this report was produced – sixty-one missiles were fired by terrorist groups, thirteen of which fell short endangering the local population in the Gaza Strip. Of the dozens of missiles which did explode in Israel, two caused direct hits on houses in Sderot, fortunately causing no injuries. Earlier in the day three people were injured by a mortar in the Sha’ar HaNegev area. 07:36: four missiles hit Eshkol, one hit Sdot Negev. 10:05: one missile hit Eshkol. 10:59: three missiles hit Eshkol. 12:25: one missile hit Sdot Negev, one missile hit Eshkol. 15:49: one missile hit Ashkelon, one missile hit Eshkol. 16:54: two missiles hit Eshkol. In other words, the synopsis to this report understates the number of missile hits on southern Israel after the 72-hour ceasefire was broken by terrorist groups at 04:00 and then expired at 08:00 on August 8th by at least a factor of ten. He goes on to further erase from audience view the fact that Israel agreed to an extension of the truce whilst Gaza Strip terrorist organisations breached it four hours before its end and then refused its renewal. But later on in his report, Reynolds has something very interesting to say. 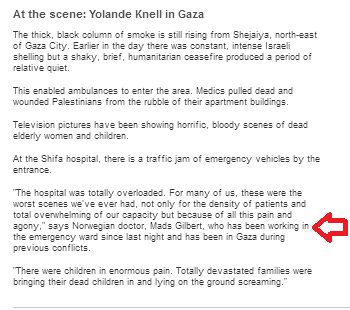 In other words, the BBC knows that the ordinary people of Gaza know that Israel will not deliberately target a medical facility (or any other civilian target not used for terrorist purposes) and yet it continues to vigorously promote the myth of the targeting of hospitals in allegations made by its own reporters, in allegations made by selected interviewees and in allegations made by the politically motivated NGO Amnesty International which were amplified in two BBC articles on August 8th. That certainly demands some explaining. 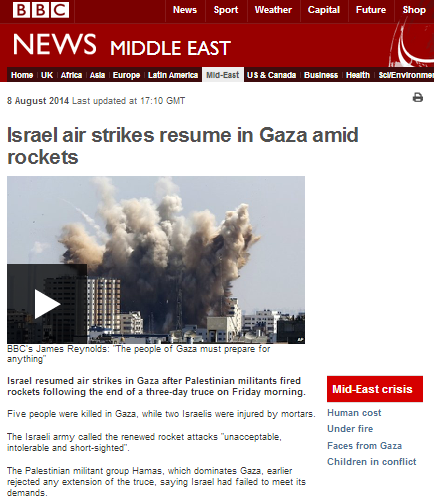 How did the BBC News website report renewed missile attacks on Israel? At 08:00 local time on August 8th the 72-hour ceasefire brokered in an attempt to bring an end to the month-long hostilities in Israel and the Gaza Strip expired. Israel had already agreed to its extension but Hamas (contrary to public opinion in the Gaza Strip) officially rejected any continuation of the ceasefire an hour before its end and it had in fact been breached some four hours earlier when terrorists in the Gaza Strip fired two missiles at the Eshkol region at around 04:00. At 08:01 sirens sounded in Ashkelon and the barrage of missile attacks there and elsewhere in Israel resumed. After two and a half hours of intense fire on Israeli villages, towns and cities, Israel announced the resumption of responses to attacks. Readers are not told that Israel did agree to extend the truce until the article’s thirteenth paragraph. The fact that missiles had been fired into Israel four hours before the ceasefire officially expired is only briefly mentioned in the report’s tenth paragraph and no effort is made to clarify to readers the very relevant fact that – as the previous 68 hours of quiet showed – Hamas can stop all missile attacks by other factions when it chooses to do so. Part of the report relates to the topic of casualty figures, once again citing “Palestinian officials” without proper clarification of the fact that those officials are actually Hamas functionaries. UN statistics are also presented without transparency regarding their source and the political motivations of the NGOs behind those figures. “Some 1,940 people have died in four weeks of fighting in Gaza. Palestinian officials say at least 1,875 people have been killed since Israel launched Operation Protective Edge on 8 July with the stated aim of halting rocket fire from militants in Gaza and destroying the network of tunnels it said were used by militants to launch attacks inside Israel. 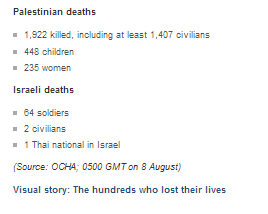 By the time this report appeared, the BBC had already published its article by Anthony Reuben concerning the need for caution with regard to reported casualty figures from the Gaza Strip. No link to that report or reflection of its content appears alongside the figures presented in this report. A prominent theme repeated throughout the report is the topic of Hamas demands. As has been the case in much of the BBC’s recent coverage, audiences are not provided with factual background information regarding the reasons for the implementation of border restrictions by Egypt and Israel and are not told of the implications of any easing of restrictions in terms of the renewed flow of weapons and tunnel-building supplies to the Gaza Strip. The article closes with amplification of allegations made by Amnesty International. With the BBC having so far done its utmost to whitewash the topic of Hamas’ use of medical facilities and having failed completely to report on the topic of Hamas’ use of ambulances during the fighting and the role played by the Palestinian Red Crescent Society (cited by AI) as both a secondary source for the UN casualty figures cited earlier and an organization engaged in politically motivated delegitimisation of Israel, readers will of course lack the background information necessary in order for them to be able to view Amnesty International’s claims in their correct context. In fact, as noted above, missiles were fired at the Eshkol region at around 04:00 – four hours prior to the ceasefire’s end – not “shortly before” – with the resulting breach of the ceasefire therefore inadequately reported by the BBC. Like its predecessor and many other prior BBC items, this report also presents context-free promotion of Hamas demands. Likewise, despite the earlier appearance of the BBC’s report by its own statistician on the need to view casualty figures with caution, this article again presents such figures with none of the essential background regarding their sources and no link to that earlier BBC report. A link is, however, provided to the inaccurate BBC article titled “The hundreds who lost their lives” which was published on the same day. That article by the BBC News statistician concerning the need for caution regarding casualty figures is looking more like a token piece by the day. The BBC has yet to provide its audiences with the much-needed comprehensive overview of why border restrictions were put in place in the first place and the grave security implications of Hamas’ demand to lift those restrictions, including the potential rearming of terrorist organisations in preparation for yet more hostilities. Whilst it promotes and amplifies Hamas’ demands, the corporation continues to fail to meet it first obligation to BBC audiences to provide information which will enable them to reach informed opinions on this topic. Of all the hundreds of items of coverage of the events of the last month in Israel and the Gaza Strip which have appeared on the BBC News website (and we’ll be doing the maths soon), this one stands out both for its sheer banality and for doing the exact opposite of the task entrusted to the BBC in its public purpose remit: “build a global understanding of international issues”. “Several UN-run schools sheltering thousands of Palestinians fleeing from the Gaza conflict have been hit by shelling since the conflict began. Deliberately targeting civilians who are sheltering in buildings that have no military purpose is illegal under international law. If readers were by now anticipating some sort of discussion on the laws of warfare between experts with differing legal opinions or perhaps even an article outlining the complexities of carrying out a military campaign against a terrorist organization which deliberately targets civilians whilst itself embedded within a civilian population, they would be sorely disappointed. What they got instead were monologues from two people, neither of whom has any discernible legal training: a history student from Israel and a pediatrician from Gaza. Perusal of the article quickly shows that the Israeli contributor is actually only there to tick the BBC’s impartiality box. 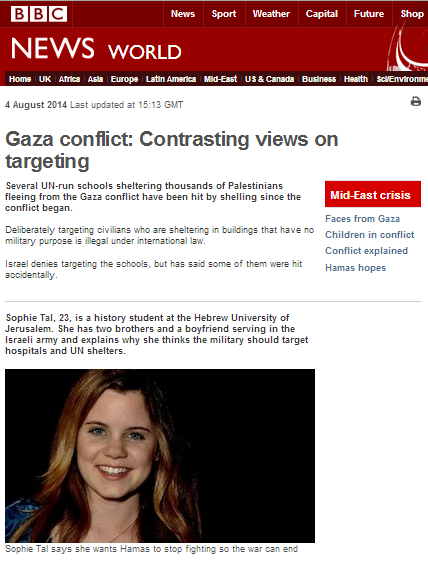 The real aim of this article is to once more persuade BBC audiences that Hamas and other terrorist organisations do not turn the local population of the Gaza Strip into human shields, inter alia by using public buildings such as mosques, hospitals and schools as sites from which to launch attacks, to store weapons and as command centres. Specifically, we find that this article yet again engages in ‘Wafa washing’ – attempts to persuade BBC audiences that al Wafa hospital in the Gaza City neighbourhood of Shuja’iya was not used by Hamas and other terrorist organisations and that Israeli actions there were unjustified, if not violations of the laws of war. Previous examples of that can be seen here and here. “The Israelis say they have to bomb the hospitals and shelters because there are fighters here, but that is not true. The only people we have are sick people. You never see any fighters or soldiers on the streets. It’s just not true and yet the rockets keep coming. Firing on hospitals and schools is inhumane and this is the third time this has happened. Palestinians who have been forced out of their homes by Israeli rockets are not safe in the shelters, you are not safe in the streets. For those of us who still have homes it is now better to stay at home and wait for the rockets to end your life, either on purpose or accidentally because the Israelis don’t know what they want to target. How can they win when they have no military targets, it is just civilians they are firing on? We are not attacking anyone. When this round of hostilities commenced there were roughly 20,000 members of Hamas’ Al Qassam Brigades active in the Gaza Strip. Well over 3,300 missiles have been fired from that territory in four weeks. Cross border attack tunnels which took years to build and used hundreds of tons of concrete were constructed: ten of them alone in the neighbourhood of Shuja’iya where al Wafa hospital is situated. And yet Dr Switi is allowed to tell BBC audiences that “you never see any fighters or soldiers on the streets”. As for Switi’s claims that there were no “fighters” in Wafa hospital; well no matter how many times the BBC tries to push that line, the evidence shows the exact opposite. The video below shows Hamas terrorists firing from al Wafa hospital, along with secondary explosions after it was struck – indicating that weapons and/or explosives were stored there – and the entrance to a tunnel located in the hospital grounds. Moreover, ample opportunity was given to avoid a strike on al Wafa hospital. “Hamas transformed Wafa Hospital, a civilian building in the Shuja’iya neighborhood of Gaza City, into a command center, rocket-launching site, observation point, sniper’s post, weapons storage facility, cover for tunnel infrastructure, and a general base for attacks against Israel and IDF forces. 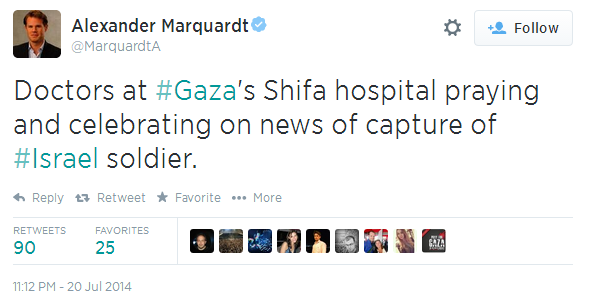 Hamas repeatedly opened fire from hospital windows and used anti-tank missiles from the premises. Hamas deliberately and cynically turned the hospital into a legitimate military target. The BBC’s interviewee Dr Switi, however, miraculously saw and heard nothing. Instead of accurately and impartially informing its audiences of what really happened in Shuja’iya in general and at al Wafa hospital specifically – including showing them filmed evidence which has been available in the public domain for two weeks already – the BBC continues to facilitate the promotion of Hamas propaganda. Moreover, the BBC cynically co-opts the language of “international law” as a prelude to an article which is just its latest contribution to the politically motivated lawfare campaign currently underway. The statement in this article’s opening lines – “Deliberately targeting civilians who are sheltering in buildings that have no military purpose is illegal under international law” – has no purpose but to raise in the mind of the reader that such a scenario may have taken place. That statement is followed by “Israel denies targeting the schools, but has said some of them were hit accidentally”, with absolutely no information provided to readers regarding the legal issues associated with the placement of military targets in or near civilian facilities such as schools – as documented below by France 24. This article is but one example of many to have appeared in the last few weeks illustrating the way in which the BBC’s self-conscription to a political campaign has been allowed to trump its obligations to its funders. The International Solidarity Movement (ISM) is – as readers are most likely aware – an organisation which since the early days of the second Intifada has been providing financial, logistic and PR support to terrorist organisations which attack Israeli civilians. One of the ISM’s activists currently located in the Gaza Strip is American Joe Catron who has been very busy in the past three weeks giving interviews to the Iranian regime-run Press TV, putting out propaganda material and acting as a voluntary human shield. Catron’s “standpoint” can be discerned very easily from his use of social media. 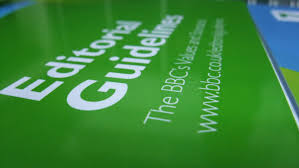 As readers also know, the BBC’s editorial guidelines oblige it to inform audiences of an interviewee’s “standpoint” so that his or her contribution can be understood in its correct context. However, when the BBC World Service’s Dam Damon interviewed Joe Catron for the July 31st edition of ‘World Update’ (available here for a limited period of time from around 43:21, or here as a separately promoted podcast), he failed to inform listeners that Catron is a member of the Hamas-supporting ISM and made no attempt whatsoever to “summarise” his “standpoint” with the result being that listeners were subjected to over three and a half minutes of undiluted Hamas propaganda, supposedly from a ‘neutral’ source. So what did World Service radio audiences learn here and did anything in this interview contribute to fulfilling the BBC’s obligation according to its constitutional document to “build a global understanding of international issues”? Well, they discovered that the BBC considers filmed and photographed evidence of the discovery of weapons, missiles, explosives and tunnel entrances in at least one hospital in the Gaza Strip to be “rumours on the internet”. They got to hear the BBC provide a platform for Joe Catron’s obviously dishonest claim that Wafa hospital was not used by Hamas for military purposes and his promotion of the notion that the hospital in which he is currently located – Shifa – is not used by Hamas either. That of course is especially ridiculous in light of the fact that the BBC has interviewed at least one member of Hamas at that location. Audiences also discovered – for the second time in two days – that not only has the BBC no intention of informing them about what really went on at Wafa hospital in Shuja’iya, but that it will actively hinder that information from coming to light, along with any other documentation of the use of civilians in Gaza as human shields. They were also misled by Catron’s assertion that the foreign media in Gaza is able to report freely and that there cannot be any Hamas abuses of hospitals because the foreign media has not reported them. Increasingly, evidence coming out of the Gaza Strip shows that claim to be patently untrue. Listeners were exposed to Catron’s unchallenged and inaccurate assertion that over one thousand civilians have been killed in the Gaza Strip. They were misled with regard to the civilian targets of Hamas missiles as Catron spouted propaganda straight from the Hamas handbook claiming that it targets military installations. 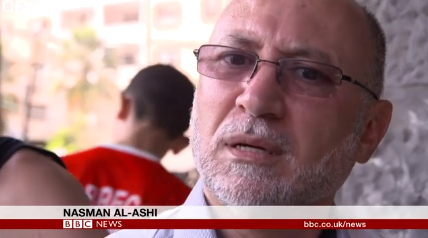 Clearly, the broadcasting of this interview with a Hamas supporter fails to contribute anything to the fulfilment of the BBC’s public purposes and the fact that his “standpoint” and affiliations were not declared to listeners breaches editorial guidelines. No less worrying for the BBC should be the fact that it has rendered itself utterly indistinguishable from the Iranian regime’s media mouthpiece which Joe Catron usually frequents. One of several BBC journalists ‘parachuted in’ to the region recently in order to cover Operation Protective Shield is Paul Adams – usually based in London as a World Affairs correspondent. On July 18th the BBC News website published an article by Adams initially titled “Gaza casualties mount amid Israeli ground campaign” but later renamed “Hospital on Gaza conflict’s front line”. In his fourth paragraph Adams adheres to what has been standard BBC practice since the beginning of its reporting on this operation: the quotation and promotion of figures supplied by the Hamas-run health ministry in Gaza without any qualifying statement regarding the fact that they have not been independently verified by the BBC and with no attempt made to distinguish between civilian and combatant casualty figures. Depending on the time at which Adams wrote those words, he should of course have pointed out to BBC audiences that at least fourteen terrorists were among the casualties on the first day of Israel’s ground operation. A considerable proportion of Adams’ report relates to the Wafa rehabilitation hospital in the Shuja’iyeh neighbourhood of Gaza City which, incidentally, also accommodated members of the International Solidarity Movement with the staff’s knowledge and consent, although Adams refrains from mentioning that fact. “I found the patients and staff from the Wafa rehabilitation hospital sheltering in a Gaza City clinic. The Wafa has been hit repeatedly in the past week. It’s close to the border and very close to some of the latest Israeli military activity. 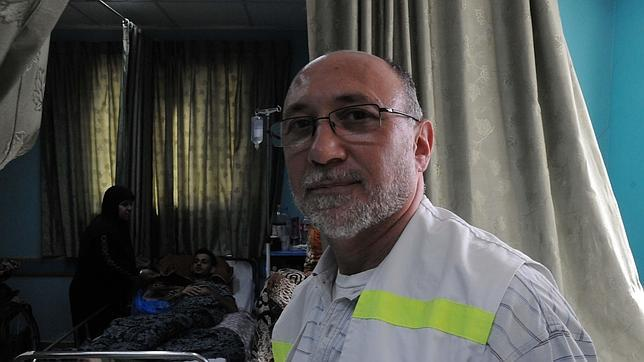 Basman al-Ashi, the hospital’s executive director, said everything seemed quiet on Thursday night, until shelling intensified in the hours before troops entered the Gaza Strip. In fact, the hospital’s staff were directly alerted to the need to evacuate the premises by the IDF on the evening of July 15th –47 hours before the ground operation commenced – even according to B’Tselem. General warnings were also issued to residents of that neighbourhood and others on the morning of July 16th. 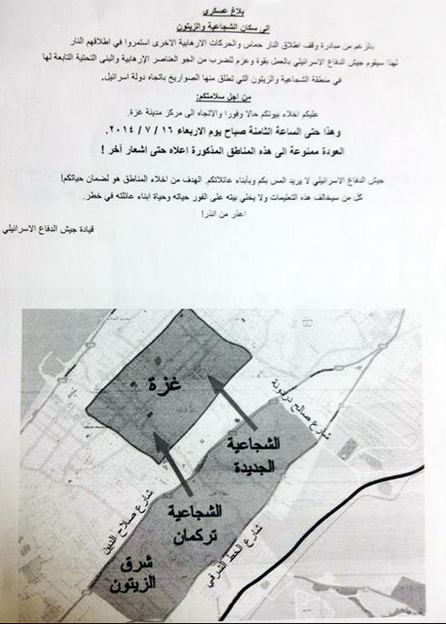 Contrary to the impression which readers receive from Adams’ report, the actual reason for the evacuation warning was the presence of terrorist infrastructure located near to the hospital. Significantly, he does not ask the hospital’s director about the actual situation – i.e. 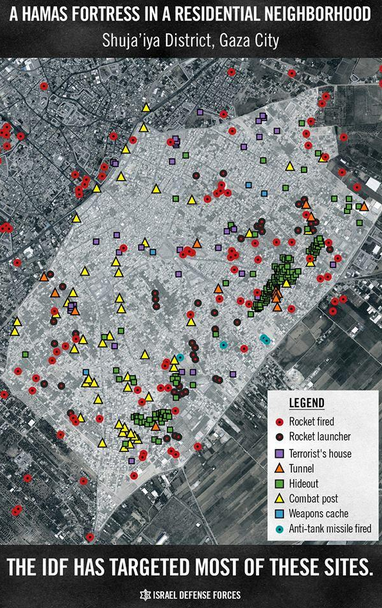 that areas near the hospital have been used for the purposes of terrorism. Adams does, however, take the opportunity to promote and amplify the hospital director’s use of a Nazi analogy. “Basman’s eyes closed for a moment in weary resignation, but opened wide in defiance when I suggested the actions of Hamas might simply make matters worse. “It’s a very natural response for the Palestinians to respond, to defend themselves,” he insisted. Israel, he said, had made “a concentration camp of 1.8 million people”. Even if that is what an executive director of a Gaza hospital with close links to the ISM actually said, there is no justification and no excuse for the BBC’s amplification and propagation of Nazi analogies. It would have been helpful to BBC audiences’ understanding of the reality of the situation had Adams bothered to explain to readers that – contrary to al Ashi’s inaccurate claim – Israeli policy concerning the Gaza Strip is the result of the terrorism perpetrated by Hamas and other groups rather than the other way round. However, it is perfectly clear that Paul Adams did not set out in this article to provide BBC audiences with accurate and impartial information which really would enhance their “understanding of international issues“.